At the end of January, it was my husband's birthday. It was time to make my very first decorated vegan cake. I decided to convert a non vegan recipe that I had been using for a long time (prior to becoming vegan). Although the cake turned out nice, the cake base was not great, and I would not use that recipe again without some tweaks. I then realised, that in 2011 I made a dairy free cake for my nephew. When I went to check on the recipe in my old blog I realised that the cake was in fact vegan. The reason I had dismissed that cake previously was because it was then filled with non vegan filling and iced with non vegan icing. 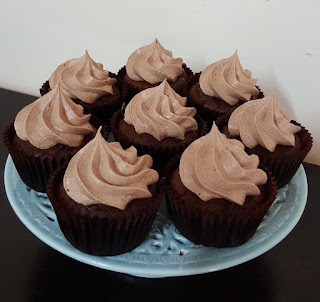 I decided to try the recipe again for cupcakes, and with the tweaks I had recommended in my old blog. Add the cocoa and keep mixing, then add the sugar one tablespoon at a time, until all combined.